Because my wife was on maternity, the laptop rarely got used, however when she went back to work I noticed the battery waasn't working well. It would fully charge, however after being turned off the battery would be dead. I've completed a battery test & the battery was fine, so someone mentioned running the built-in HP support software and updating the drivers etc. I updated everything and the battery was sorted no problem whatsoever. However after minutes of use the laptop would BSOD and I kept missing the error message. I then after trying various things rolled back the software to an earlier date and which has solved the BSOD, however the battery is back to square one. I then restored the laptop to see if it would help ANC for a while I though it did until it started all over again. I've tried memory tests based on what someone said and various other tests. 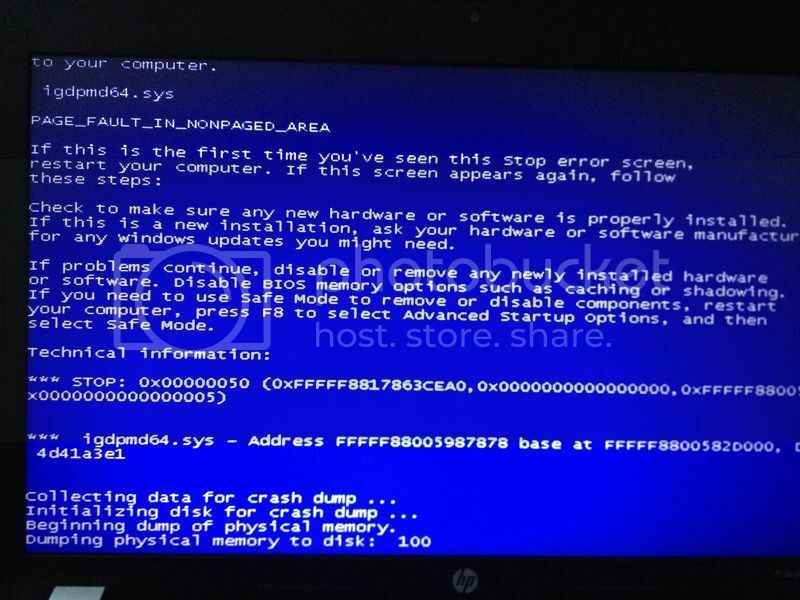 I've noticed it only really happens when I'm on the internet and managed to catch the following pictures of the BSOD. Monitor(s) Displays IIyama prolite 24"
Bump the thread if I don't respond in 24 hours. Hi, I know it has been 8 months since my last post, but I've been fairly busy and just got the laptop out ready to try again. I did try and find the drivers, but I struggled to find exactly what I needed. I also didn't know the difference between the video drivers. Any help would be much appreciated. The HP Website has some new Drivers available now ..